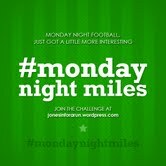 #Mondaynightmiles will be a simple you pick who you think will win the Monday night football game challenge. If you are right, you owe nothing and can brag a little. If you are wrong you owe 5 miles. You can do your miles all at once or spread it out over the week, just as long as your 5 are done before the following Monday night game. Be sure to check back for my pick of who I think will win the Monday night game each week and leave your pick in the comment section for a little bit of friendly competition! Here is to a fun-filled football seasons with lots of #Mondaynightmiles!! Next Post Monday Night Miles!